The Capital Barbie: Pleated Please? Happy Monday to you. Did you have a good weekend? I sure did. Relaxing, a little bit lazy, a little bit social- just my kind. Today I want to talk about a great detail to add to your wardrobe. When done correctly it is super chic and preppy, when not....balloon-like. Pleats! Tommy Hilfiger, Chambray pleated skirt, $36!!! Chambray (denim) is huge for Spring and Summer! Add pleats and adorable pockets and you've got your go-to item for the season. 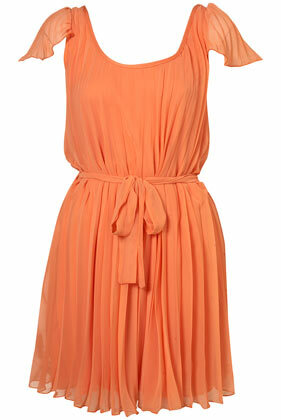 I'm loving this swingy, airy dress for Spring. Great color and the pleats add dimension to the silk. This detail is quiet and sophisticated. Perfect for work or pink heels! Let me be clear: I don't approve of pleats on shorts or pants unless you try them on; because 9 times out of 10 you will look like you're going to take flight. However, if you find silky, soft shorts that are pleated, like above- snag them. They're gorgeous. I love this flowy top for work or play. The color and pattern is so interesting and the pleats make a unique neckline. So when you buy pleats, think two opposites: very flowy and light or very structured and preppy. The inbetween will give you an extra 10 pounds! That first skirt is just darling! Feel free to link up to Fashion FRiday!!! These pleats are great! I love your picks. That chambray skirt is my favorite. Love it! Hey morgan! what's your site so I can stop by? New visitor from 'it list'. Love that orange dress. I am so looking for sheer and flowy pieces like this for spring as well.